April's Little Family: Welcome, Autumn! Business is a little slow right now, so we've been sticking close to home. But, what a great time to do so! Florida has officially said goodbye to summer and the weather's been GORGEOUS. We've been spending a lot of time outdoors this past week and will, hopefully, continue to do so. 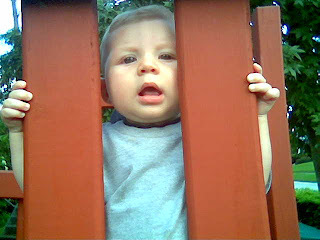 Wes took the boys to the neighborhood park this evening while I started dinner; unfortunately, he did not heed my advice to bring the camera. 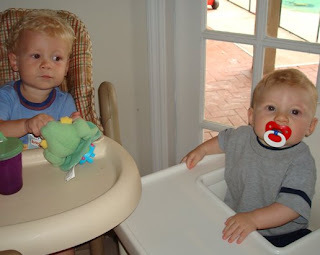 So I can only relay to you that hubs says the boys were being "super cute" and "I should've brought the camera." 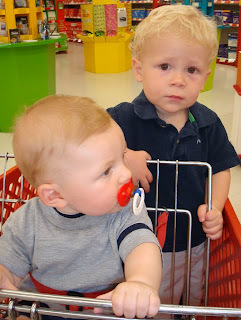 Apparently Casey was pushing Jonathan in the swing and getting bumped in the face on the swing's return trip. Both boys thought this was delightfully funny. 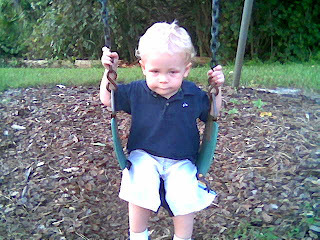 Also, Casey used the big boy swing for the first time! I would have video for you, except someone didn't consider the camera necessary. 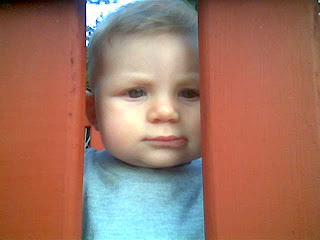 He did manage to snap these cute shots of the J-man & the Face with his trusty cellphone camera. So, I guess he's not all bad. My shots of the boys at Staples and in their highchairs are clearly better - but then, it's hard to compete with perfection. Your kids are gorgeous! How far is Oviedo from Orlando? sorry I'm so geographically challenged. Anyway, thanks for dropping on my EC widget. It's good following your blog. technically oviedo borders orlando, but from downtown oviedo to downtown orlando it's about 30 minutes. 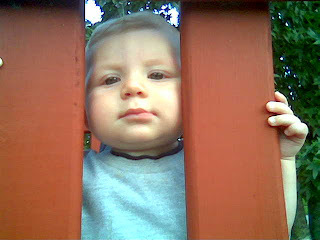 I love these shots - especially the ones that look like your son is between fence posts. What a great perspective.